Resident shelter from floodwaters next to a rural education centre in Primavera, a rural community in Cura Mori District , 32 kilometres from the city of Piura, Peru. In the North Coast departments of the country, some 445 000 people – 59 per cent of affected households – are food insecure. In the wake of the heavy rains, floods and landslides that hit Peru earlier this year, the United Nations agriculture agency said today that it is working with the Government to assist some 7,000 mostly small-scale farmers to restore their capacity to produce crops and feed their families. Citing preliminary estimates, the Food and Agricultural Organization (FAO) said that adverse conditions caused by the coastal El Niño phenomenon from January to March had affected about 445,000 people in Peru’s worst-hit northern coastal areas – 59 per cent of affected households. “According to Peru's Ministry of Agriculture and Irrigation, more than 60,000 hectares of crops have been severely or partially affected and 18,000 hectares were left completely unusable,” FAO reported. To address the situation, the Government approved the Agrarian Reactivation Plan with an investment of $76 million. FAO seeks to complement this by requesting some $3.1 million from the international community to support activities aimed at restoring family agriculture in the remote areas of Piura, Lambayeque and La Libertad. “The FAO recovery project will provide the necessary inputs to establish orchards, recover irrigation infrastructure and provide technical assistance in animal health,” the UN agency explained. FAO stated that these activities will be implemented directly, with affected farmers receiving cash-for-work transfers for household income generation, access to food and mitigating migration to cities. “In Piura, Lambayeque and La Libertad, FAO will support the rehabilitation of local supply markets, to ensure that farmers and fisher folk can quickly reinsert themselves into these marketing channels so that they obtain direct sources of income,” the agency added. As climate disasters are the emergencies that most impact food security and agriculture in Latin America and the Caribbean, FAO is calling on the international community to support the recovery of the livelihoods of the affected farmers and farmers, coordinated with the national government and subnational governments. According to FAO, addressing these challenges requires adequate risk governance, early warning and monitoring systems, implementation of good practices and risk prevention and mitigation technologies in the agricultural sector, to ensure a rapid response focused on saving lives and livelihoods. FAO, together with the UN Office for Disaster Risk Reduction (UNISDR), is supporting countries in Latin America and the Caribbean to develop a Regional Strategy for Disaster Risk Management in the agricultural sector and food and nutritional security, in response to a request by the Community of Latin American and Caribbean States. 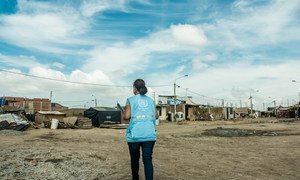 The United Nations and humanitarian partners in Peru are expected today to launch an appeal for $39.2 million to provide urgently needed aid to people affected by the latest flooding in Peru.